It may not appear to be anything like the sketch but it is based on it - honest! I just put the design in the centre instead of at the side and used a square card instead of a C6 size. The 2 squares either side of the image are actually one square from the Labels 1 Nestie, cut in half. You see? Obvious. It would have been nice to put a few flowers on but it's for a blokey friend, who really hasn't got much of a feminine side! This is beautiful, Claire! 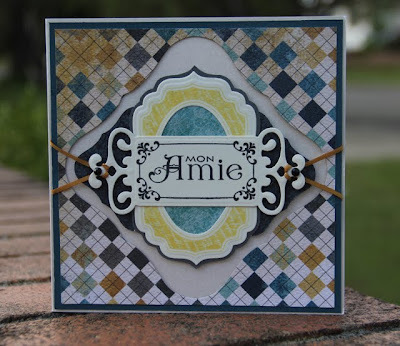 I just love how you cut a diamond shape that matches the argyle paper! Your colors are fantastic, too. And oooh that layered label! The twine is so pretty wrapped around that fancy tag...I neeeed to get those nesties :) So glad you could play along with the WMSC this week! I love the halved square, looks great, as do the colours, well done and thanks for playing along with the Mischief Makers this week! This is beautiful Claire, the colours are marvellous! Outstanding Clare. Love the patterned paper and how wonderful it helps the focal image to pop from the page. Outstanding job...thanks so much for playing along with the Waltzingmouse Stamps Sketch Challenge.